Hello friends! 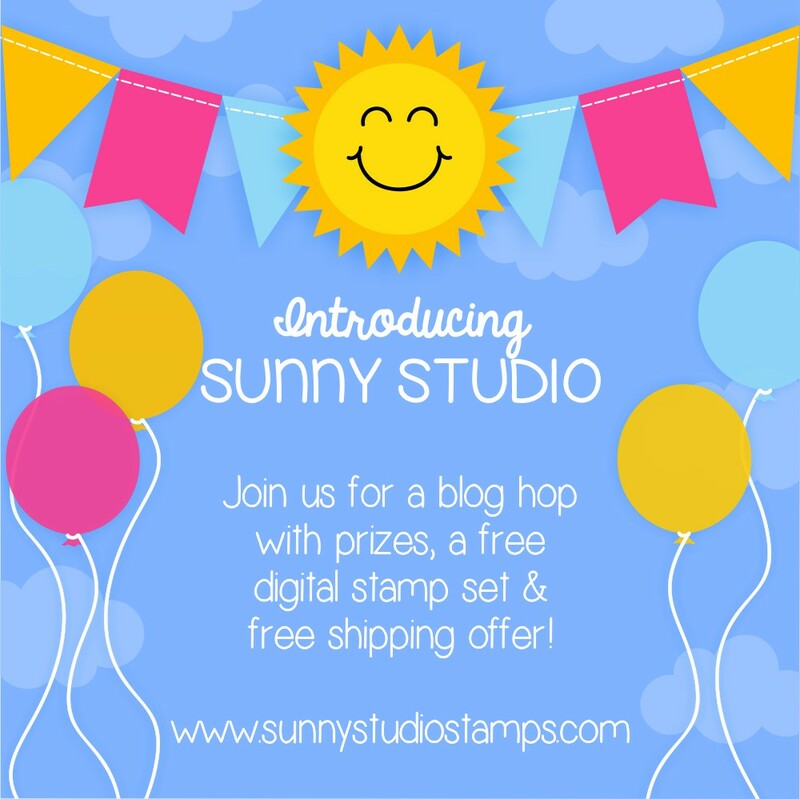 Today I am honored to be a guest designer for the Sunny Studio Stamps grand opening celebration blog hop! If you started at the beginning of the hop, you should have arrived from my talented friend, Francine Vuilleme’s blog! If you are just joining us, the complete blog hop list is at the bottom of this post, and you can also go back to the Sunny Studio blog to see the full hop details. 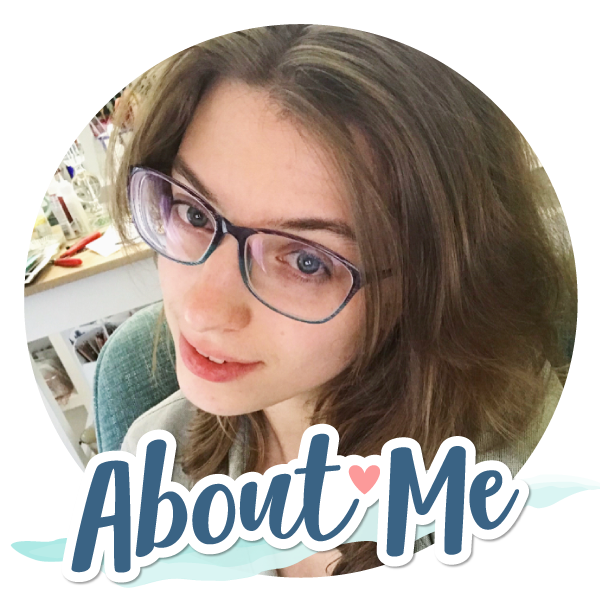 The Sunny Studio stamp company is owned and operated by the sweet Mendi Yoshikawa, who is known for her adorable and happy paper crafting style…. just like her new stamps! 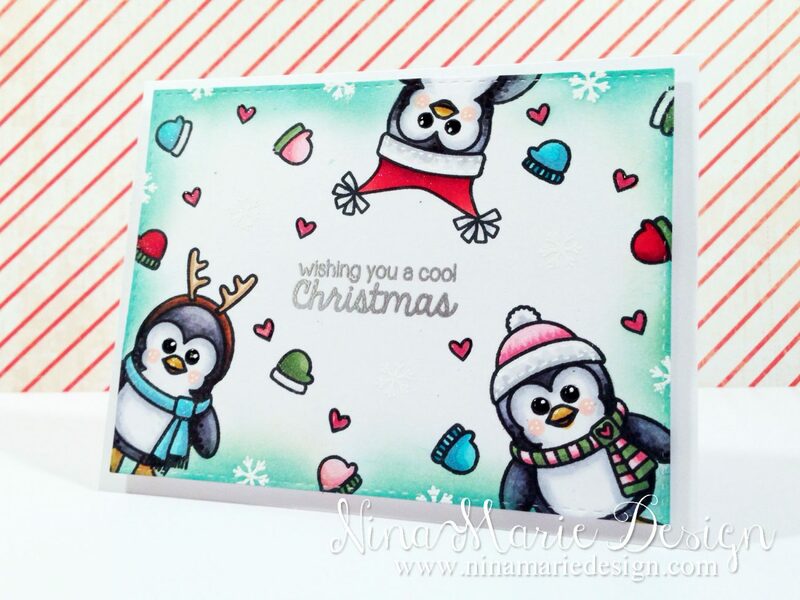 For my cards in the hop, I have chosen to work with the cute penguins stamp sets, because I love Christmas! :) The stamp sets are Bundled Up and Snow Kissed. My first card features Bundled Up… I love how you can customize the penguin to wear different hats, scarves and mittens! 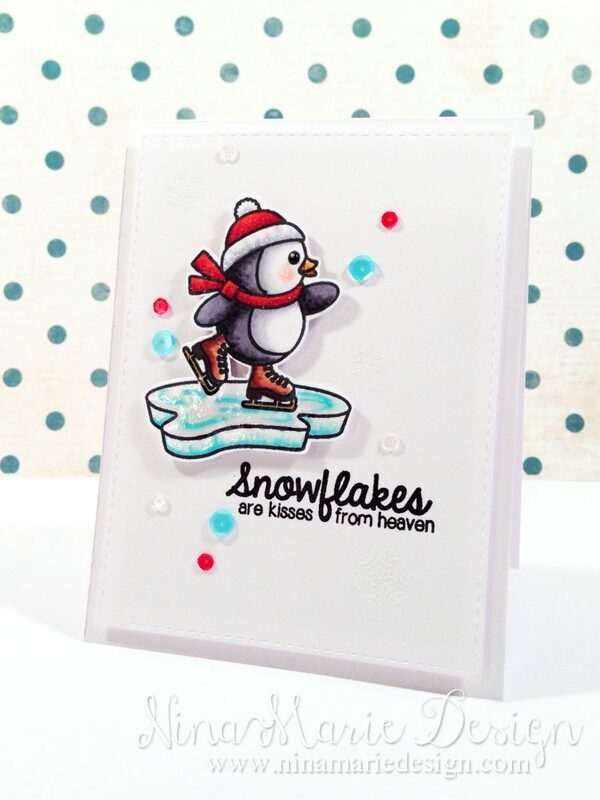 I stamped and masked three penguins, each in different outfits, and scattered some mittens, snowflakes and hearts around for a fun, whimsical feel. The images are colored with Copic markers and I inked the edges of the panel using Cracked Pistachio distress ink. And of course, no Christmas card is ever complete without a bit of sparkle and shine, so I applied Wink of Stella glitter over all the clothing articles on the card. 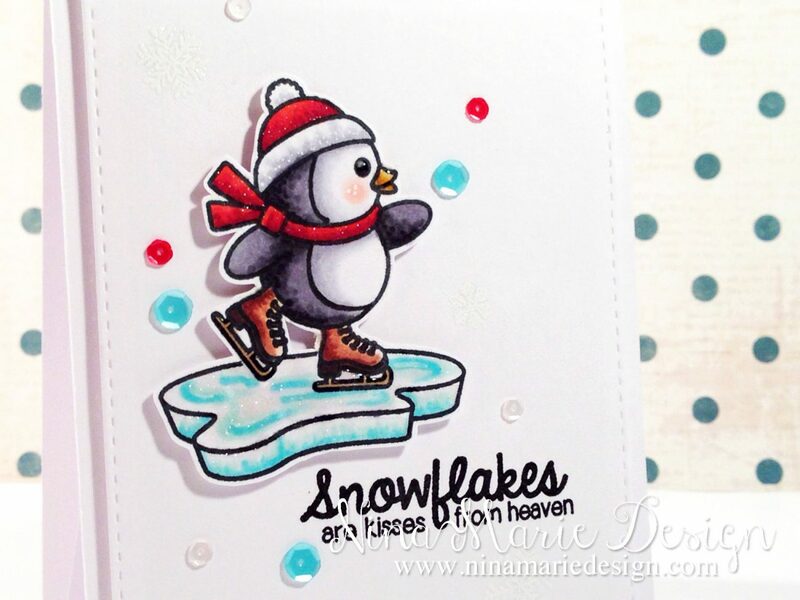 Next up, we have the Snow Kissed stamp set… I just adore all the cute images this set has; a sledding penguin, a skiing penguin and a skating penguin, which is what I used on my second card for today! To see how I created this card, be sure to watch the video below! Next stop on the hop is another sweet friend of mine (also know for her happy style! ), Audrey Tokach! Thanks so much for stopping by, and enjoy the rest of your hop! What is a blog hop without fabulous prizes and fun stuff??? For the hop Sunny Studio will be giving away stamp sets to three lucky winners! 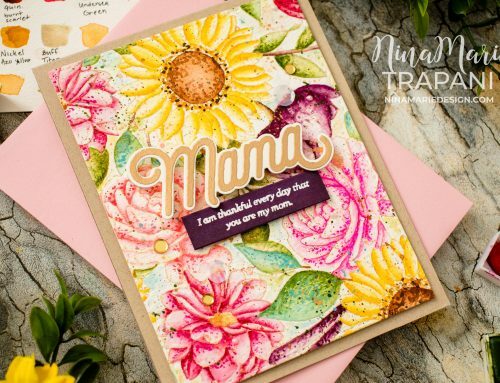 Not only that, but Sunny Studio is offering a free digital stamp download on the Sunny Studio blog and free shipping for all orders over $35 in the Sunny Studio Online Store. Love this stamp set! Your cards are adorable. I just love the cute and adorable images!! Your card is so stinkin’ cute!!! I’m as taken with the little penguin and you have used him is so many different ways it definitely inspires me.! Very cute cards. Your first card with the penguin peeking down from the top made me giggle. Found you through Mendi but will have to spend some time checking out your site by the looks of it… cute cards! Love how you used the mittens and snowflakes to make a background! 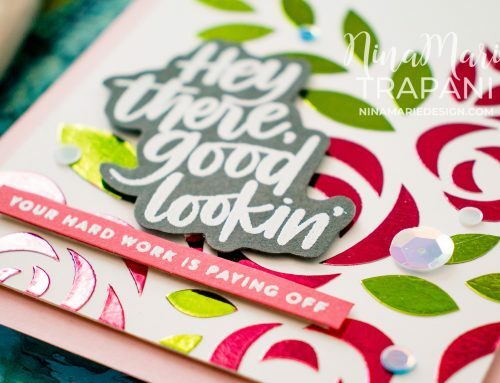 Cute card designs and fun colors. 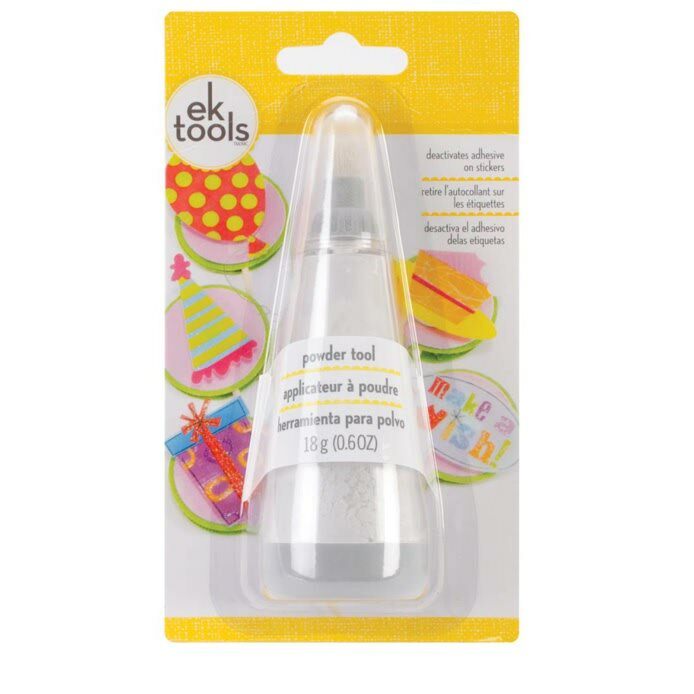 I am so glad Jennifer McGuire clued me in on this new stamp company! I’m loving what I’m seeing! 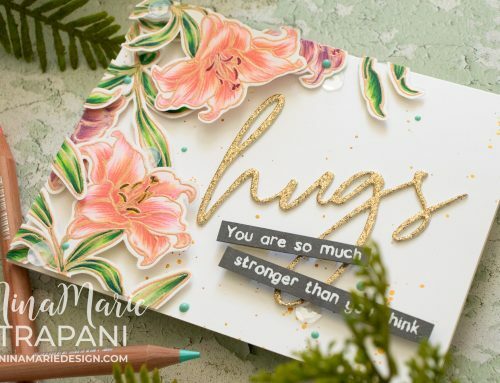 FOR GOODNESS SAKES – BOTH of your cards are AMAZING!!! Love your skills with color choices and your coloring is fantastic!! I am so very impressed by and in love with these cards!!! 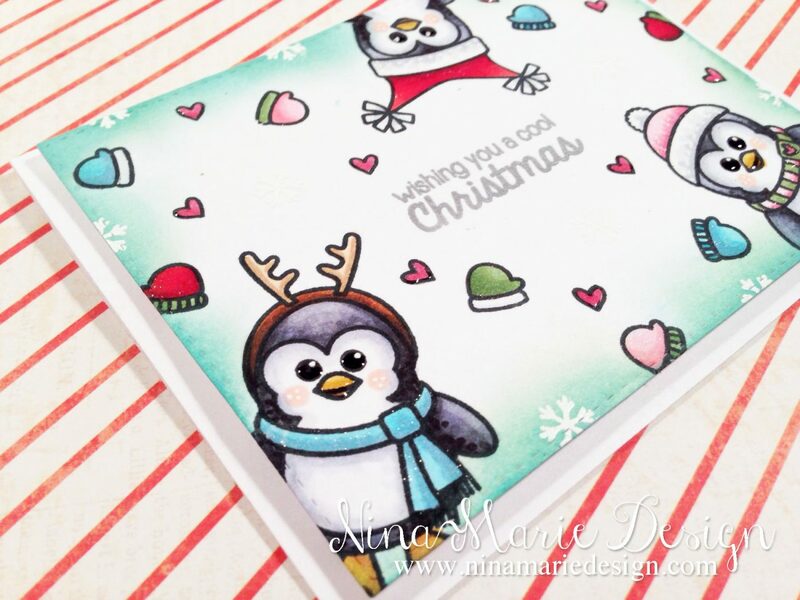 Wonderful cards – I love the penguins stamp set! Adorable cards!!!!! These penguins are super cute! I love how you dressed them up in different hats and scarfs!